At its premiere in 1804, Beethoven’s epic “Eroica” Symphony No. 3 flung open the door and boldly strode into the 19th century of Romantic music. For its debut in 1894, Debussy’s Prélude à l'après-midi d'un faune gently drew open a curtain that offered a look at the music yet to come in the 20th century. Both were the start of something big. Alas, for the Grand Rapids Symphony, both come at the end of the season. Debussy’s evocative Prelude to the Afternoon of a Faun in the first half and Beethoven’s mighty “Heroic” Symphony capped off the 10th and final concert of the 2016-17 Richard and Helen DeVos Classical series on Friday, May 19. Though you do have one more chance to see and hear it on Saturday. It’s well worth it. Tickets still are available. Guest conductor Larry Rachleff, who as Music Advisor led the Grand Rapids Symphony through thick and thin for two years prior to the appointment of Music Director Marcelo Lehninger, returned to conduct the final concert of the season whose planning he oversaw. Making it even more a familiar affair, Rachleff brought with him his wife, soprano Susan Lorette Dunn, to sing selections from French composer Joseph Canteloube’s Chants d’Auvergne. Beethoven’s ground-breaking Third Symphony, whose opening movement alone is as long as most four-movement symphonies by Haydn or Mozart, needs little introduction to regular concert goers. Nor does the 47-minute symphony, recently named in a survey by BBC Music magazine of 151 working orchestra conductors as the greatest symphony of all time, need an apology for programming. 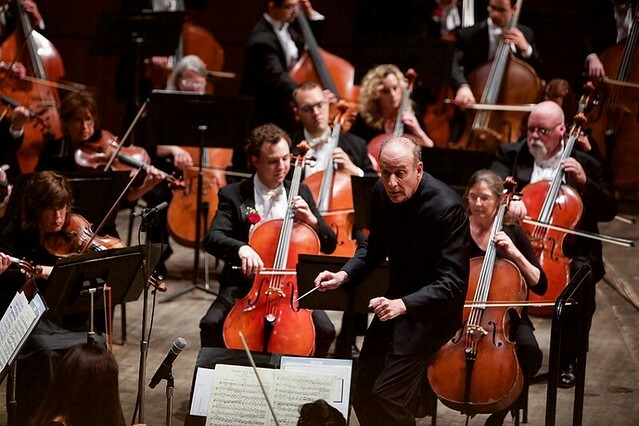 In its 87-year history, the Grand Rapids Symphony has performed it at least 10 times previously. Today’s audiences can’t be shocked by the size and scope, by brief moments of surprising harmonic dissonance or by frequent passages of unexpected accents. We can enjoy its extraordinary celebration of the human experience just the same. Rachleff, well acquainted now with the orchestra at his disposal, conducted an ennobling and empowering performance that felt fresh. Conducting without a score, Rachleff deftly teased the audience through the deceptive endings. We know they’re there, but Rachleff’s treatment added immensely to the fun. Nimble woodwinds and a stalwart section of horns were highlights of the third movement. Gorgeous counterpoint across the string sections made the fourth movement. The joyful finale was hair-raising. The standing ovation was immediate and enthusiastic. The first half of the evening was given over to the soft and sensuous sounds of French music. In fact, Rachleff crafted a “mashup,” as he put it, with three of Cantaloupe’s Songs of the Auvergne followed immediately by Afternoon of a Faun followed immediately by three more of Canteloube’s folk songs from the rural region in central France where the local language spoken is Occitan. Australian soprano Susan Lorette Dunn was soloist in five authentic folk songs that Canteloube dressed up for the concert hall with woodwinds serving as reed flutes and shepherd’s pipes, harp portraying flowing river water, and piano depicting the play of light on everything. Dunn is a sunny soprano with a sweet voice who tells a good story. The songs are playful and even a little silly. Songs such as Malurous qu’o uno fenn, a playful bourée exploring the dilemma whether it is better to be in love or out of love; and Lo Fiolaire, a sensuous tribute to a beautiful girl, spinning at her wheel, complete with the sounds of her wheel in the refrain, both ended with chuckles from the audience. By the final two songs, Bailero, arguably the best known of the entire collection, and Lou Coucut, a song about a cuckoo bird, with onomatopoeia abounding in its texts, Dunn had the audience eating out of her hand. The Debussy, led off by principal flutist Christopher Kantner and the famous opening flute solo, was exquisitely rendered. A lesser orchestra should not play this 10-minute exploration of color and timbre out of fear that it would confuse the audience. The Grand Rapids Symphony, however, makes it into a magical experience. As is the custom, musicians of the orchestra celebrating anniversaries were recognized. Twelve in all, who have tallied 5 years of service all the way up to 40 years each for principal violist Leslie Van Becker and double bassist Kevin Flannery, were acknowledged for their combined 235 years of service. As well they should be. Without the musicians, there is no music.